Fishing tips that can help you "pull a Rabbit out of the hat" on your next trip Northern Minnesota and the 1000 Grand Lakes Area. Right: Doubles like the two pictured at right aren't un-common during the peak of fall walleye fishing. The cooling water temperatures and shorter days trigger feeding that continues until the fall turnover. Knowing where to look and what to use, is the secret to cashing in. By now there aren’t many folks who haven’t heard about or sampled the great fall fishing in Northern Minnesota. There’s no doubt about it, fishing the fall runs in Minnesota’s 1000 Grand Lakes Area can be a real bonanza. The problem is, timing is everything and unless you can take off at a moments notice on those "perfect fall days", the weather can dish out some really unpleasant surprises. Some of us who depend on producing fish every day for our customers have learned that adaptability is the number one key to success and that this ability to adapt to changing conditions is never more important than in the fall cold water period. Over the past twenty years as a professional guide, I’ve learned to watch for patterns in weather and water conditions that make it easier to decide where and when to concentrate my effort on the water. Will the fish be deep or shallow? Are they in the weeds or on the rocks? Will they bite on minnows or night crawlers? These are a few of the questions that make or break my business each day and here are some of my favorite fall patterns that I watch for and use to help keep the fish coming in for my customers. Walleyes in transition from summer to fall are Generally scattered and found not only in the shallow weeds, but also on deeper main lake structures. Smaller humps that are generally good in early/mid summer can still hold a few fish, but the larger bars with immediate access into both deep water and easy access to the shoreline flats are prime locations. We locate schools of fish that are moving from deeper water or larger flats as they move toward the shoreline and vice versa. The huge flats associated with these structures have room for lots of fish to spread out while they roam around looking for easy feeding opportunities. There are always a few "false starts" in the early fall where it begins to look like the shallow water fall patterns have begun and then without warning, the fish move back out to the main lake. I believe this is the time of the season when the Walleye action comes and goes with the wind and fish that move in to the shallows at "prime feeding times" give us this false impression of a long lasting move to the shallows. So there are actually two patterns, one deep and one shallow each occurring at roughly the same time. In the shallows, playing the wind to your advantage is really fairly simple. When the wind blows, we concentrate on the shallow breaklines, paying particular attention to weed beds and areas of rocks and gravel. Wind speed and direction are equally important and I tend to favor areas where the wind is moving parallel or slightly into the shoreline. A key tip to remember is that fish will usually travel moving into the current that’s generated by the waves. So if the wind blows from the same direction for a sustained period, you should be expecting fish to move slowly ahead into the current and stop to feed as they encounter pockets of baitfish that gather on points, inside turns or in weed beds. Over the course of a few days, sizeable groups of fish can assemble up current from where the original school of fish was located. Always check locations further up wind before you leave the area. Bait choices are easy during this early fall period because almost everything works, at least a little bit. Jig & minnow combinations, crank baits, spinners and live bait rigs will all put some fish in the boat. I tend to favor "action fishing", so for me jigging is the first choice. Trolling shallow running crank baits like Salmo’s Sting and Perch Series baits produce a variety of fish in these shallow areas, so we will sometimes troll the crank baits as a way to locate fish. Once we find them, we’ll work the area more thoroughly with the jigs. Trolling speed for most of the Crankbaits is between 2.5 and 3.5 miles per hour and we try to stay very close or even slightly into the weeds. When we fish jigs or live bait rigs in the shallows, it is important to check all of the angles. Fish the inside and outside edges of weed beds and occasionally check the flats just outside the deeper weed edges. Calmer days in this early fall period generally call for fishing the deeper structures like in the deepest-heaviest weeds, further out on the flats or on main lake bars that connect to shoreline structure. These fish tend to be less active than they are when they go shallow, but they can still be caught providing you keep looking until you find them. I use my electronics to search for fish on the flats while we’re trolling with deeper running versions of these crank baits. Some folks prefer to do this with bottom bouncers and spinners and both methods are good ways to search for groups of Walleye and fish at the same time. You’ll often pick up a fish here and there as you cover the water and eventually you’ll locate a better than average group of fish. When you find them, switch over to jigs or live bait rigs and work on the school as long as you can stay with it. Fish on the flats are often on the move; so don’t stick around too long if the action stops. Get back into search mode and try to locate a new school of fish. Always take a look at the deeper water on the main lake breaks too and when you find fish in these areas, fish them with a combination of live bait rigs and jig & minnows. This is the prime time of the season, with fish feeding aggressively and action that can last all day long. Like the early fall pattern, a nice stiff breeze is better than a really calm day, but the key difference is that fish are usually feeding actively. Most of the time, anglers can still be catching decent numbers of fish when the conditions are a bit off, even on calm days or during weather changes. This prime fall period begins when the water temperatures cool down to around 60 degrees and the weed growth in the shallows begins to die. Both Walleyes and baitfish that have lived in these weeds for most of the summer move out to the deeper edges and gather along the shallow water drop offs and on rock/gravel bars. This period peaks just before turnover and ends when the turnover occurs. One of the key differences between this and the early fall pattern is that with the bait fish and Walleyes now gathering on the more open shoreline drop offs, these areas are a lot easier to scan with your electronics and makes it a lot easier to spot fish and bait on your screen. Walleyes are actively seeking food and minnows become the only game in town because the colder water signals the end of insect hatches. Follow the breaklines just outside the deeper edges of larger weedy flats while you watch for areas that contain good schools of baitfish and the refine your search in these areas until you begin to see signs of a school of larger fish. Since there’s a lot more fish out in viewable territory, you should always wait until you spot prime areas before starting to fish. Be sure to scan rocky areas, which are also key locations during this period, especially on windy days. It can sometimes be a little trickier to see fish on your electronics when you’re over really shallow (less than 6 feet) rocks, so I will usually spend some time fishing these whether I see fish immediately or not especially if it’s breezy. 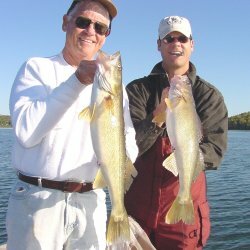 Bait choices for Walleyes during this peak fishing period are usually fairly simple because the fish are willing to respond to minnows. Whether you fish them on jigs or live bait rigs depends on the conditions at the time. My favorite minnows for jigging in the fall are Spot Tail Shiners, which unfortunately are getting harder and harder to come by each year, so I’ve come to rely on a very close second choice; nice, large Fatheads. When it comes to fatheads in the fall, the larger the better, with minnows of up to 4 inches in length producing very well. Rainbows, Dace, Golden Shiners and a host of other minnows will work in a pinch. But if you shop around until you find a bait dealer who has what you need, the rewards will be worth the effort. Jig choices should be tailored to the depth, wind and lake bottom conditions. I generally use jigs ranging from 1/16 ounce on up to about 3/8 ounce and in a variety of shapes and balances. These weights will cover you in water depths from 4 to 50 feet. Always experiment with sizes and shapes until you find the one that works best for the conditions you’re facing on that day. Shape and size does make a difference, in fact this is most likely more important than colors when choosing your offerings. Another key tip in jigging is to vary your jigging style. One day the fish will respond nicely to aggressive hopping or snap jigging, the next day they may prefer a light wiggling motion, dragging the jig & minnow on the bottom and even just lowering the jig over the side of the boat and fishing it vertically. Don’t get stuck in a rut, if your usual approach is failing you on a certain day, vary your style and put some bonus fish in the boat. For live bait rigging, larger, lively Rainbow Chubs are readily available and work very well. These minnows are hearty and stay alive a long time. Lip hooked on a #2 or #4 hook with a 5 to 6 foot leader will work great. The Red Tail Chubs, so important to anglers in neighboring areas to the South and West are rarely an advantage in the 1000 Grand Lakes Area. Don’t get me wrong, they do work and if you come across a good supply bring them along, but there’s no need to go out of your way to find them. Whenever I pick up my bait each day, I try not to fall into the trap of getting too comfortable with only one bait choice for the day. This catches so many anglers off guard and has ruined more than a few good fishing trips. Even though fall fishing usually calls for minnows, there are times when night crawlers work better and I always have a supply of "yard bait" on hand. Many times in late September, the fish will adjust to calmer days by tucking into the deeper weed edges or laying low in the gravel. Creeping along with a lively crawler has put fish in the boat at times when jigging or rigging minnows were working poorly or not at all. Occasionally Leeches will work too, but each day the water temperature gets colder, leeches become less productive. I usually have a couple of dozen just in case of emergency. The phenomenon known as the "fall turnover" occurs when the lakes surface water temperature becomes colder than the deeper water below. I start watching for this whenever the water temperature falls to around 56 degrees. The cooler surface water sinks to the bottom and warmer water from below churns up to the surface. The turnover has a scattering affect and fish that were schooled up are now spread around the lakes in much smaller groups. The first few days after this turnover occurs can be tough fishing, even for the experts. But, there is one key tip that can help you get through it; once you get the inkling that your favorite lake has turned over, start planning your fish day to begin later and end shortly after dark. Beginning with this period and lasting for most of the winter, Walleyes will usually bite fairly well for about an hour just before dark. I have learned to watch my graph closely during the day and when we find schools of fish that either won’t bite or provide only a little sluggish action, I’ll make a mental note of these areas and about an hour before dark, I’ll head back to the area where I saw the most fish earlier in the day. At this point you are making an educated guess and you only get one chance because once it gets dark; it’s too late to change your mind. But, most of the time the fish do cooperate and you’ll go home smiling. Another way to beat the turnover is to find a lake with a really deep water Walleye bite. The truth is, this pattern can occur during early, mid or late fall because lakes of this type seem to be immune from the unsettling effects of turn over. The key characteristic these lakes have in common is that they all have huge shallow flats that plunge rapidly into deep water of 80 to 100 feet or even more. I fish a half dozen of these lakes and when the weather is right, this is one of my favorite ways to fish for Walleyes in the fall. We have caught fish as deep as 70 feet, so you need to have calm water or at most, a light breeze. Too much wind and you lose the boat control that is critical to making this pattern pay off. Follow the steep breaklines watching your electronics for schools of fish that will almost always be holding on a point or inside corner on the breakline. Once you locate a school of fish, hold the boat directly above them and drop your jig and minnow vertically to the bottom. Jigs weighing 3/8 or 1/2 ounce will do nicely if you keep your boat steady, if you can’t get down to the fish with 1/2 ounce or less, you need to consider switching lakes because it’s either too windy or you have other boat control problems that need to be overcome. River fishing is another great way to spend a late fall afternoon and is a particularly good way to avoid high winds on the lake. Almost everyone has heard, or read about jiggin’ the holes in rivers in late fall. The pattern actually is to locate the deeper holes and then fish the areas of shallower water just upstream and sometimes downstream from the holes. It’s rare that the fish will locate in the deepest portion or in the center of these holes. It helps to think of the hole as if it were a small lake, fishing the edges of this "lake" in the same way you would fish the drop offs in a real lake. In our rivers, these structures help the fish by breaking the current flow and providing baitfish a place to hold out of the current. Feeding Walleyes take advantage of the opportunity to catch these minnows in these slack water areas. A key is to fish the hole from several angles, being sure to cover all edges. Begin your search for Walleyes by moving down river and watching for these deep water holes. You’ll see evidence of the hole on the rivers surface. Eddies or whirlpools are evidence that you located a proper area to begin. Move back up river from the hole and fish the shallower flat and repeat the process on the down river portion as well. When you locate fish, it is usually best to anchor within easy casting distance and work the edge thoroughly. One of the nice features of fishing the rivers is that Walleyes tend to be fairly aggressive biters, probably because feeding in the current forces them to act more quickly than their lake cousins do. Jig & minnow, spinners with crawlers or live bait rigs with minnows will all catch fish on these river spots. Crankbaits trolled slowly up current along the edges of these holes will also catch some nice fish. For this, we wait until very late in the season when the river water clears up and becomes less tangled with weeds and floating debris. After a couple of trips on moving water, you’ll find that location is generally more important than your choice of baits. These are clues to some of the patterns that I’ve used over the past 20 years to help put fish in the boat consistently. Each one of these patterns should be the subject of it’s own article, but this should give you an idea of what to look for when you show up for your fall fishing trip. For me, on any given day I won’t know which of these patterns will be called for until I show up at the lake and find out what the weather and water conditions are. A little persistence really pays off and your ability to adjust the game plan and adapt to changing conditions will give you the advantage you need to be successful on a regular basis.